I love the way Tim Taylor describes economic wealth and income trends as it were a mouse under a napkin that turned out to be a scorpion - the wealth tail! http://conversableeconomist.blogspot.com/2019/03/wealth-consumption-and-income-patterns.html\\ Many of us who watch the economy are slaves to what's changing in the relatively short-term, but it can be useful to anchor oneself in patterns over longer periods. 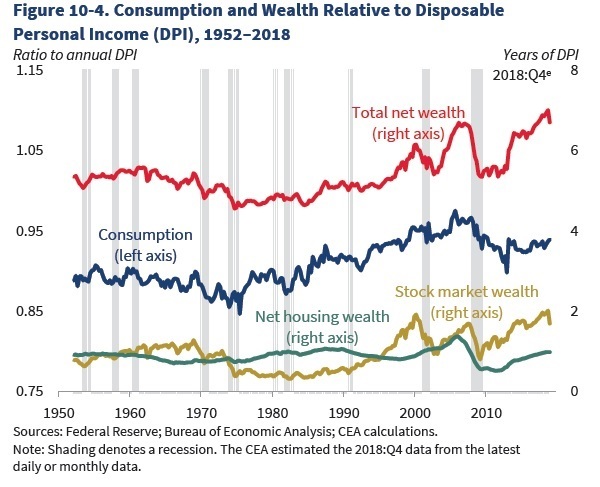 Here's a graph from the 2019 Economic Report of the Presidentwhich relates wealth and consumption to levels of disposable income over time. 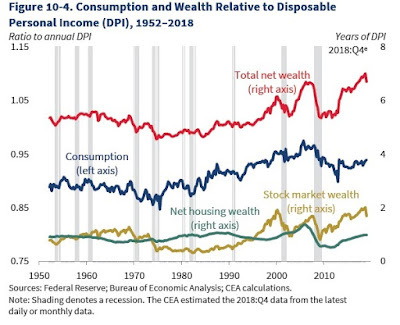 The red line shows that total wealth has typically equal to about six years of total personal income in the US economy: a little lower in the 1970s, and a little higher in recent years at the peak of the dot-com boom in the late 1990s, the housing boom around 2006, and the present. The blue line shows that total consumption is typically equal to about .9 of total personal income, although it was up to about .95 before the Great Recession, and still looks a shade higher than was typical from the 1950s through the 1980s. Total stock market wealth and total housing wealth were each typically roughly equal to disposable income from the 1950s up through the mid-1990s, although stock market wealth was higher in the 1960s and housing wealth was higher in the 1980s. Housing wealth is now at about that same long-run average, roughly equal to disposable income. However, stock market wealth has been nudging up toward being twice as high as total disposable income in the late 1990s, round 2007, and at present . A figure like this one runs some danger of exaggerating the stability of the economy. Even small movements in these lines over a year or a few years represent big changes for many households. What jumps out at me is the rise in long-term stock market wealth relative to income since the late 1990s. That's what is driving total wealth above its long-run average. And it's probably part of what what is causing consumption levels relative to income to be higher as well. That relatively higher level of stock market wealth is propping up a lot of retirement accounts for both current and future retirees--including my own.